Race Off brings back fond memories of Mattel’s die-cast toy cars, monster trucks and the epic orange racetrack. This physics-based racing game lets you control iconic Hot Wheels vehicles like Dawgzilla, Rip Rod etc. collect more than 20 road beasts and race them in over 40 crazy racetracks. The game’s simple control system makes it very easy to play. All you have is a gas pedal and brakes and with these two virtual buttons you can control your car’s speeds, pull off insane stunts and get to the finish line before your opponent does. You get a speed boost when you press and hold the gas pedal, but doing this will also drain your fuel tank faster. Look at the fuel bar at the top of the screen and you will know how quickly the bar decreases when you step on the gas for some time. Try to save as much fuel as possible until you spot a gas refill on your way to the finish line. Don’t just press the gas pedal every time. Step on the gas while ascending a steep track. Steep tracks make it almost impossible for your vehicle to move up and pressing and holding the accelerator will make the ride much smoother. It will increase your vehicle’s speed. Before doing anything else, upgrade your vehicle’s “Speed”. This will make it easier for you to ascend steep tracks and you will be using less fuel. You may also have to press the gas pedal to tilt the vehicle in mid-air so that it lands safely on the track. Light taps on the gas pedal will make it possible for a safe landing in case your vehicle is nose diving into the track. Vehicles in Hot Wheels: Race Off are almost life-like. You can get a 360 degree view of your unlocked vehicles at the gallery and they look so cool! Each stage has 10 levels and 5 unlockable vehicles. There are 4 stages: Off-road, Alternative, Muscle and Creature. To unlock vehicles for a particular stage, you will have to upgrade all attributes of your present vehicle to max level. You will have to use coins to upgrade stats. For example: There are 5 unlockable vehicles in the Offroad stage. To get the second vehicle, i.e. “Dawgzilla”, you will have to collect coins and then keep upgrading Rip Rod’s “Speed”, “Grip”, “Stability” and “Tilt”. Once all attributes reach max level, the next vehicle, i.e. “Dawgzilla” will be unlocked. To unlock the third vehicle, “Dune It Up” you will have to use Dawgzilla to collect coins, use those coins to upgrade and max out all attributes. You cannot use “Rip Rod” to unlock the third vehicle. In a nutshell you will have to use the first vehicle to unlock the second, second vehicle to unlock the third, third to unlock the fourth and so on. If your sole objective is to try out new vehicles in a stage, then you should first try to collect as many coins as possible to unlock them. You will have to choose an easy level and keep playing that level to collect coins. If you have unlocked Dawgzilla and want to unlock third vehicle, then use Dawgzilla in the first level. Level 1 is pretty easy and you can replay this level again and again to collect coins. This way you can get coins faster and then use them to upgrade each attribute to max level. When you have unlocked the third vehicle, use it to play the first level or second level. Replay those two levels to collect as many coins as possible and upgrade all stats to max level to unlock the next vehicle. If you want to unlock levels instead of cars, then try to use the fully upgraded vehicle to complete a hard level. Wheelie: This can be performed by driving on two wheels, where the front end wheels are lifted up and the rear wheels stay on the track. A “Wheelie” is triggered when your truck keeps moving in this position for a few seconds. Endo: This is just the opposite of wheelie. Your vehicle’s rear wheels are tilted up and the front end stays grounded. It’s triggered when your vehicle keeps moving in this position. Big Air: Probably the easiest “stunt”, Big Air can be performed by just jumping high up in the air. Big Air and Wheelie are two most easy-to-pull-off stunts and you will be performing them quite often, without needing to do anything special with those two buttons at the left and right side of the screen. Back Flips: To perform a back flip, your vehicle should be launched high up in the air. When in mid-air, press and hold the gas pedal to tilt your vehicle up and perform a full 360-degree back flip. You can also do the front flip high up in the air by pressing and holding the brake pedal on the left side of the screen to make your truck tilt forward and perform a full 360-degree front flip. Don’t overdo back flips/front flips. You can easily perform at least one back flip when your vehicle launches high up in the air. 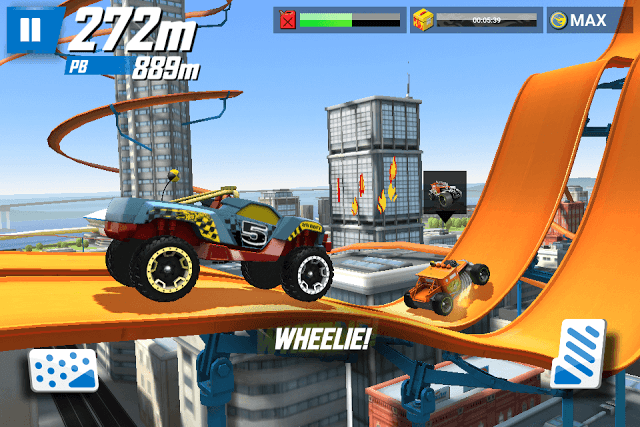 A Hot Wheels monster truck is at a maximum risk of crashing when it’s launched high up in the air. While it’s the best time to do these flips, chances of landing on its back and exploding are also more. Many times, your car will “nose dive” into the track and then flip and explodes when it hits the ground on its back. When it nose dives and is close to the race track, tap the gas pedal to tilt up your vehicle so that it lands on all 4 wheels. When your vehicle is tilted backwards, tap the brakes pedal to tilt it forward so that it does not land on its back. Your taps depend on how close your vehicle is to the race track. Just make sure you don’t press and hold any of the two buttons for too long. In Hot Wheels: Race Off, running out of fuel is inevitable because the fuel tank drains little by little when your vehicle moves. Thankfully, there are gas cans placed at key spots on the race track. You will need to make it to a gas can before you run out of fuel. But sometimes, your fuel tank will be empty before reaching a gas refill. A warning sign will be shown on the screen and an orange exit button will appear. Before pressing that button check how far your vehicle moves. You never know what’s in store ahead and there might be a gas can close by. When the exit button appears, your vehicle continues moving in the background. If you are lucky it may just bump into a gas can, which will give you another opportunity to race again. Press the exit button only when there’s a steep climb as the vehicle won’t be able to move because the gas pedal disappears.